Toby Catlett is a veteran of both the U.S. Air force and Navy Reserves. For the last 13 years, he worked as a firefighter and paramedic. Recently, he decided he wanted to open his own business. 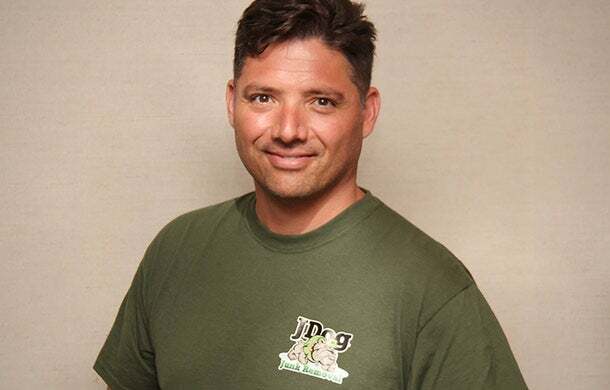 JDog Junk Removal caught his eye as a franchise that offers more than a veteran discount program: The company only sells franchises to military veterans and their families. Here's what Catlett has learned since entering what he calls a "stinky" but enjoyable business. Franchise owned: JDog Junk Removal based in Lake Worth, Fla. I was in the military and when I got out, I was working as a firefighter/paramedic. With this job, my schedule allows for me to have time for a side business. I’ve always wanted to own my own business and build something from scratch so that I could be in charge. I’ve been a firefighter/paramedic for 13 years. Between that and being deployed twice through the Navy, I’ve been busy. When I officially got out of the Navy in 2010, I really wanted to start a business. I looked at starting a lot of things from scratch – a real estate business, a biohazard cleanup business and others, but in the end, joining a franchise business with a turnkey program was really what I needed. What struck me about JDog Junk Removal was that it was only offered to military veterans and that the founder of the company, Jerry Flanagan, is a veteran himself. I knew this was a job I could relate to. It was not that difficult for me to get financing and I knew I could do this job well. There are a lot of franchises out there that market to veterans and offer a discount, but this is completely different. Junk removal is also something right up my alley – as a firefighter, I am always breaking stuff and working with my hands, so it seemed to be a good fit. There’s a lot of competition in the junk removal field, but the military ties give us a competitive advantage. People want to do business with military veterans – they want people in their homes who are honest, hardworking and have integrity. I hear this over and over from customers and they bend over backwards to do business with us. They are always thankful of our service to the country. In the short time I’ve been open, I’ve also been able to give back. I have hired two out-of-work veterans that I use for larger jobs. I also have donated three trailer loads of goods like furniture, books, china and clothes to a local organization called Forgotten Soldiers Outreach, which sends care packages to deployed soldiers and also helps local displaced veterans. I got loan through USAA for $15,000, which was fairly easy to get. I paid $9,000 for the franchise fee and spent almost $2,000 on trailer and $1,500 for advertising on truck and trailer. I also spent between $15,000-$18,000 on equipment and insurances. I got most of my information through veteran and government websites. The VetFran website was extremely helpful, as well as small business sites that talked about the pros and cons of buying a franchise. One thing I was worried about was paying a franchise fee every month, but the difference with JDog is that the franchise fee is fixed, meaning it’s not a percentage of gross income. That makes it easier when you’re starting out. For me, it was the overwhelming sense wanting to be organized as I started the franchise. Juggling everything with the personal life as well as JDog was definitely a challenge. I am great at doing all the hard work and heavy lifting, so to speak, but I had to learn the organizational side. Luckily, the training through the corporate office helped to ease that fear and made it a little easier. You have to make sure it’s something you really want to do. It’s one thing to like the idea of a business, but once you sign the paperwork and you have the franchise up and running – you have to pay the bills. You must be self-motivated and you can’t wait for someone else to go out and do it for you. Junk removal is a stinky job, but I like it. You need to make sure you’re ready for the responsibility. We’re going to keep growing and doing more and more jobs in South Florida. Its hard work, but I am up for it. This area is unique because there’s great weather with no extreme cold. There is also a large retiree population with people who need assistance with junk removal. Most of our business has been word of mouth and I intend to keep it that way.